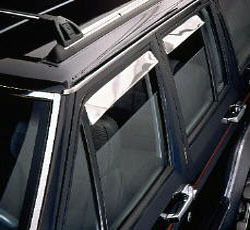 The Auto Ventshade Deflector was introduced in 1935 and it is still as functional now as it was then. These Auto Ventshade Deflectors will keep you and your interior high and dry when the going gets wet. Easy to install and built to last, it's easy to see why generations of drivers wouldn't trust anything else. 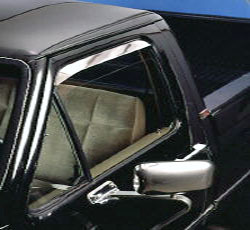 This rugged stainless steel or black finish deflectors are the most practical and durable accessory available your car or truck. It allows you to crack your windows and keep rain out while letting fresh air in! Available in Black or Stainless Steel Finish to compliment your vehicle's appearance. With over 270 custom applications, you're sure to find what you're looking for.